Pinelands Patches & I got together today to do some more cutting. We finished cutting the pieces for the rest of this block. Only took 2hr 15min !Now we have to sew. It's hard not to go right to this project. But we both have other projects that need attention too. 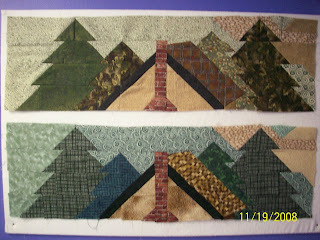 This is her block & mine ( top one's mine) to show the difference in choices of fabrics. There are a couple places where we are the same and it will be that way throughout the quilt. Can you pick them out? Soooo....the other Barb has a blog! NICEY!!! I'll let you know if I do. If not, next Friday after Thanksgiving...school is closed.